Throughout the history, humanity has always been fascinated with magic. 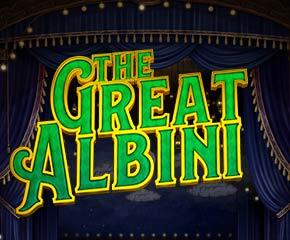 Game maker Foxium aims to take advantage of this with its magic-themed online slot called The Great Albini. It boasts graphics that are good enough to give the new year a proper welcome and a couple of bonus features that can have magical effects on the spirits of players! Read on for a thorough overview. This slots online has 5 reels, 3 rows and 25 fixed paylines, as well as 5 low-value icons and an equal number of high values. The low-values are stylised playing cards, while the high values are made up of pictures of a bird, a cup, a knife, and the face of Lily and The Great Albini. The Great Albini and his assistant Lilly are both featured onscreen at either side of the reels, with the setting being a stage that’s a little dimly lit. Mystery Box Respins – this is often triggered during the base gameplay when stacks of Boxes show up on the middle reels. These boxes are locked in position while a respin occurs. During this respin, should extra Mystery Boxes land on the reels, this is locked in place, while the respin counter gets reset to 3. This feature ends either when no extra Boxes show up on the reels or the available respins finish. A random icon then takes the place of these boxes and will enhance the chances of a big win. A screen full of top-value icons be landed during this feature, players can expect to get their hands on a maximum of 4,000x the stake. Free Spins – this bonus feature can be either bought outright or triggered by landing 3×3 free spins icons on the middle reels. 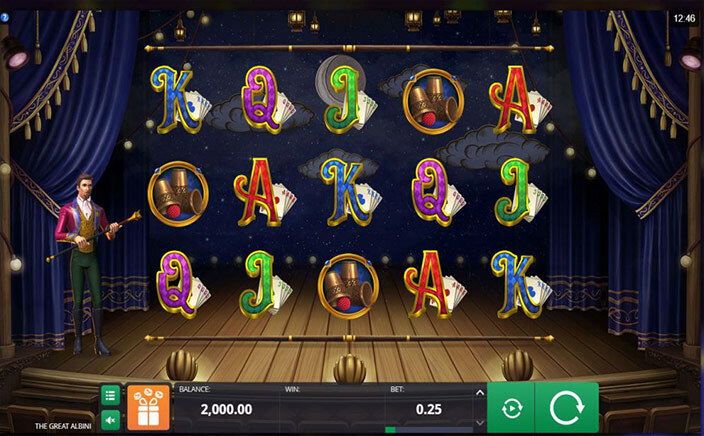 When bought, the players receive 8, 10 or 12 free spins by coughing out 100x, 125x and 150x the stake respectively. When triggered the old way, a dozen free spins are provided. The spins here happen on an expanded reel set with a 5×6 grid and paylines of 50. Wins here total 4000x the stake and can be scooped up by the activation of the Lily feature with its liberal award of free spins and win multipliers. The Great Albini slot has a lovable 3D design, some fetching audio effects and a magical aura it is difficult to ignore! While it might not be all that exceptional, it is a solid hitter that plays well and appears capable of making time pass light-fast!